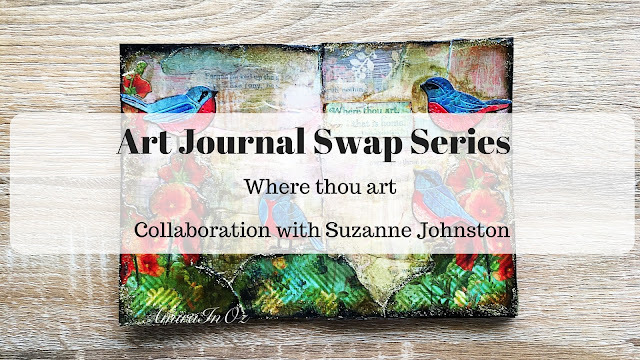 So glad to be getting to this Art Journal Swap with my awesome friend Suzanne Johnson. This is my second layout in our book. The prompt for this layout are the bird die-cuts Suzanne sent me. I started off by collaging pieces of paper from my scraps using Modpodge, followed by a layer of gesso. Next came a layer of watercolors, followed by another layer of white acrylic paint softened with a wet cloth. From there, I fussy cut some flowers out of an old G45 collection of floral paper. I then set about stencilling leaves and stems and inking the edges and applying script stamping all over to make the pieces more cohesive. Next it was time for the die-cut birds. I coloured them in using my watercolors and then added them to the piece. The quote came from the G45 scrap paper I used. I finished off the edges with some Nuvo gold glimmer paste.